Mt. Kenya National Park, a 276 sq. 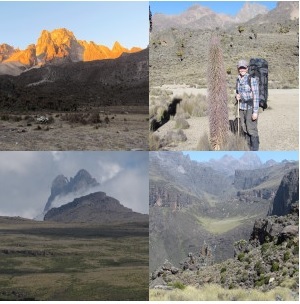 mile park located only two hours from Kenya’s capital, surrounds Africa’s second highest mountain. Mt. Kenya’s three highest peaks are Batian (17,057 ft), Nelion (17,021 ft), and Point Lenana (16,355 ft). These offer a variety of rock, ice and snow climbing opportunities, as well as non-technical summits. The mountain was created about 3 million years ago, erected from many layers of hardened lava. Over the years, glaciers have heavily eroded the slopes and created many steep valleys, which radiate from the center. One of the most striking aspects of the mountain is the vegetation bands that change with altitude. The lower elevations are dominated by dense montane forests, which contain forest elephants, Cape buffalo and Colobus monkeys. Above the forests is a belt of naturally occurring bamboo, then timberline forests, and then more open areas that are sometimes marshy and dominated by heathers. The final vegetation zone is the alien Afro-alpine. Many alpine species are found only on Mt. Kenya, including giant lobelias and a local subspecies of rock hyrax. The final zone is mostly void of vegetation. The few glaciers found around the highest peaks are retreating rapidly and it is predicted they will be gone entirely in 30 years. Note that maps are difficult to find locally and in Nairobi, and are not always guaranteed to be available at the park gates, and should be obtained before embarking if you decide to trek without a guide. The best seasons to plan a trek of Mt. Kenya is during the dry seasons: from January to February and August to September, although the mountain can be enjoyed year round.